The realms of Craftsmanship, Devotion, and Innovation are governed by Gannor, Smith of the Immortal Pantheon. His influence is found in several of the past and future inventions throughout history. Creations of exceptional quality are often presented to his altars in praise, as most followers of Gannor feel his inspiration guides their hand. The devotion of his followers is unparalleled, not just in their work, but as a major part of their everyday lives. The devotional encouragement from the church also branches out into domestic life, for followers of Devotion also demonstrate their faith through their lovers. Middleborn of the Immortal Pantheon along with his sister Isorian, by his will the fires of the Celestial forge were set aflame. The Stone of Creation, a relic of the old age, felt those flames in their newborn brilliance as Gannor forged his gift for the eldest of the Immortal Pantheon, the Wrath of Caelestis. His Masterpiece, the god slayer that played such a role in the Age of Strife, helped cement Varick’s rule and bring order to the fledging pantheon. After this it is said that he retreated from the political games of the new pantheon, withdrawing to the heart of the Darghel mountains to create the Dwarven people. It was here that he moved the Celestial Forge so that he might continue his work while still watching over his people as they grew and flourished. It is also from the Celestial Forge that Gannor sparked the stars of the sky for Ereleia from the creation of the Wrath of Caelestis, to which the empty night sky became her canvas as she arranged these sparks in patterns, naming them and leaving them for the world to marvel at. None can say exactly when the time came that brought about the feud between the Immortal Twins, Gannor and Isorian, but it is an honored tale of who came between them, Almyst, Matron of all Dwarven Women and wife of Gannor. With her death, Gannor made the voyage to Eraphus, the Isle of the Blessed only to fail to claim the soul of Almyst held there by his sister. The only record of those words spoken can be found in the very tomb of Almyst’s ashes, which no mortal has ever located. Since then the anger between the Twins has bled into their chosen people, raising animosity between the Dwarven people and their Gnomish cousins. Gannor is above all a curious perfectionist, always striving towards what lies beyond the next horizon of his work. Satisfaction in anything is always brief, for soon questions arise with ideas of how to enhance and perfect it. Since the death of Almyst and his failed quest to claim her soul, he has been known to fall into melancholic fits. His people say that the very mountains of Darghel shake with his grief and sadness. Much akin to his chosen people whom he created in his image, he bears a love of ale and spirits as well as contests of craftsmanship and battle. Gannor is more of an observer with his church, watching with intent curiosity at their industrious work. Those who become lazy or begin to slack in their faith are often stricken with the inability to create, for Gannor does not pay any heed to the unfaithful. Though not easy to anger, his smote comes with an unmerciful backlash. 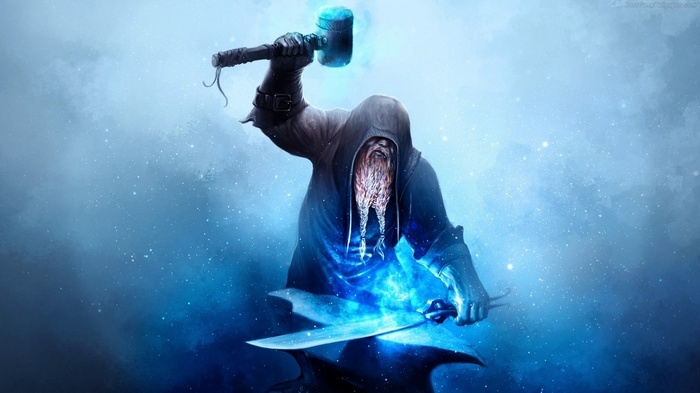 At the annual Festival of the Hammer, Gannor himself appears and spends the entirety of the festival upon the mortal plane. At this time any and all are permitted to come and speak with the immortal smith, be it to ask for his blessing or simply bear regards to him. Afterward, he vanishes back to the celestial forge, toiling away and rarely seen. Legend speaks of a wandering man seeking solace within workshops and forges across the lands of Visola. Those who have given heed to the man find a fount of tales and knowledge as he watched them toil upon their works. Many have claimed divine inspiration in their work upon the leave of the mysterious man. Whether this is Gannor himself in mortal guise has been debated in the halls of Darghel for ages, with even Gannor himself brushing off such tales as folklore. In the end, hopefuls or the devoted of Gannor bear a hospitable will to all in need of a place of rest for the night or a mug of ale to quench a thirsty palate. Little can be said of Gannor’s ambitions in Immortal politics, due to his lack of intervention beyond supporting a few favored gods. Ereleia has been a long time friend of Gannor as she tends to marvel over his beautiful creations. He also favors Anari for her devotion to spreading love and happiness among the mortal plain, which entwines with his love for devotion. Having sworn off love since the death of Almyst, Anari often challenges herself to try and persuade the immortal smith to love once more, be it mortal or immortal alike. At times his kinship with both Ereleia and Anari has caused grief between the two out of their persistent jealousy for one another. Of the godly pantheon, Faledric is another who is often allied with Gannor, the two gods both bearing a strong affinity with the mountains of Visola. Little is known of their relationship beyond this friendship, whatever secrets passed between them kept as tightly as the future. Of the rest, respect is held to all but a few, the most notable being his own sister for obvious reasons. Murelu is yet another of the few who bears Gannor’s ire, thought to have been behind many escalations of the twin’s feud, yet with no proof, the immortal smith bears him with tight tolerance.